Flag Day and Independence Day are coming up, which means you’ll need patriotic candy for your parades, barbecues, and special patriotic events! Prizes for Parades: You’ve already got a fantastic float and fun costumes, but how can you delight parade spectators even more? With candy, of course! 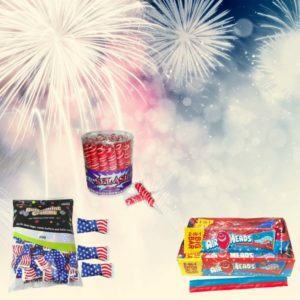 Many of our USA-themed candy selections come in individually wrapped packages with festive red, white, and blue wrappers, making them great for tossing to people in the crowd as your float rolls by. Candy for Barbecues and Parties: Create a sweet treat buffet at your party with our bulk candies available in festive USA colors! Sort lollipops, Sixlets, Hershey’s Kisses, or M&M’s into individual containers by color to create the ultimate patriotic treats display. Sweet Snacks for Watching Fireworks: Make watching Flag Day or 4th of July fireworks even more fun by bringing along some treats in fun patriotic packaging! We even have Air Heads wrapped in festive red and blue wrappers with a sparkler design. Shop with us to stock up on patriotic candy to sweeten all of your celebrations this summer!